This year’s ORTESOL (Oregon Teachers of English to Speakers of Other Languages) conference was held November 10th and 11th at the University of Oregon. The American English Institute hosted the two-day event in Agate Hall, which turned out to be a fine venue. 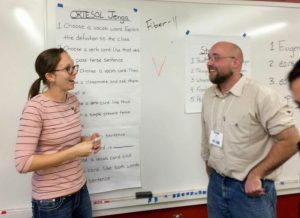 The conference featured two plenaries on the theme of “Supporting Diverse Learners” and over 50 sessions facilitated by presenters from all over Oregon and beyond. Several LTS alumni were among these presenters. Read on for highlights from some of their sessions. In a well-attended and highly interactive session titled “Teaching Tools for the Resilient Classroom” Maggie Mitteis (2016) introduced favorite activities of hers and fellow Peace Corps teachers accustomed to teaching in settings with limited (or no) technology and requiring much flexibility on the part of instructors. We played variations of the word game Taboo, an adaptation of Jenga that included language practice, and a few raucous rounds of “Stop the Bus.” A group competition using letters from Bananagrams was also a big hit. All of these games were highly motivating and adaptable to almost any language classroom. Note: These days Maggie is teaching locally at both Lane Community College and Downtown Languages. Misti Williamsen (2010) shared ideas for motivating students to read in her presentation “Going Beyond Summary: Engaging Students in Extensive Reading Through Projects.” She has found success inspiring lower level students at the American English Institute’s Intensive English Program to complete books through active participation in projects. In this session, Misti shared four of these: drawing character maps or timelines on posters, creating their own quizzes, videotaping a “commercial” for a book, and writing stories combining characters from multiple books. Misti brought along actual examples of all of these. Posters drawn by students covered three walls, and the audience was treated to the screening of several creative and highly entertaining student-made videos. 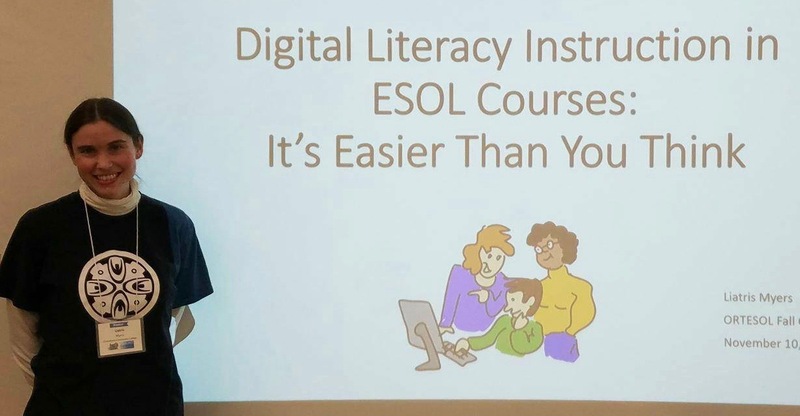 Liatris Myers (2015) presented “Digital Literacy Instruction in ESOL Courses: It’s Easier Than You Think”, which was inspired by her recent experience of creating a course and materials for teaching technology to low-level learners at Chemeketa Community College in Salem. This session included step-by-step guidelines for approaching the design of this type of course, interacting with students, and creating learner-friendly materials. 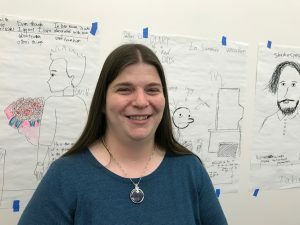 Admitting that she never considered herself particularly tech-savvy, Lia attributed her current comfort with using technology in the classroom to the four 1-credit CALL (Computer Assisted Language Learning) courses she completed while studying in the LTS program. Another popular session at ORTESOL was “The In-Class Flip: A Case for More Inclusion and Success” presented by Bené Santos (2009) and Joliene Adams (2017) with Jeff Magoto (faculty) and Emily Masucci (Anthropology Department graduate student), which featured a videotaped example taken directly from Bené’s Portuguese class at University of Oregon a week before (the clip is also part of a documentary by Emily Masucci about Bene’s life ). The example showed how to successfully implement blended learning by creating a classroom environment where students can go at their own pace in terms of Bloom’s Taxonomy. 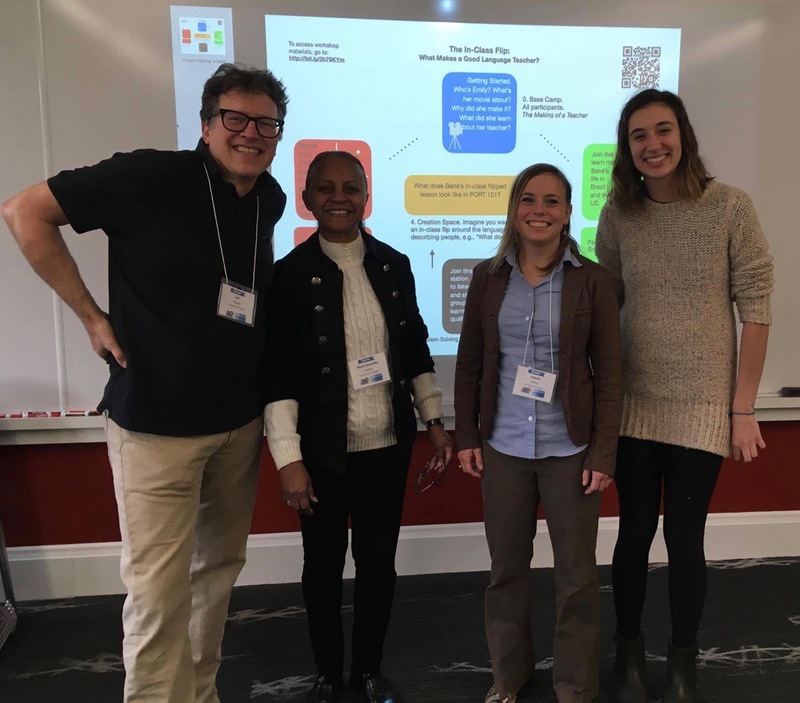 Joliene Adams presented the software H5P, which is a great interactive video tool teachers can use inside or outside the classroom. In the second half of the session, participants had time to interact with H5P, engaging in blended learning themselves, and discussed ways they could blend/flip their own classrooms. Other presentations by LTS alumni were “Creating ESL Textbooks Using Open Source Materials and Digital Tools” Sean McClelland (2011); “What We Teach: Conundrums in English Variation” Kelly McMinn (2007); and “Facilitating the Development of Argumentation Across Programs” Ilsa Trummer (2011). LTS faculty also presented at the conference. Jeff Magoto is mentioned above co-presenting with Bené and Joliene. Laura Holland’s session “Working Backward Propels our Students Forward: Small Changes < Big Effects” covered (1) teaching pronunciation of individual words and practicing stress in longer sentences, (2) analyzing what makes 2 essay introductions “good and “bad,” (3) using film clips to explore why native speakers chose the forms they did to express the messages they are trying to convey, and (4) Backward Design for curriculum development.